Felting Workshops, Felt 'Objets' and commissions. Needle Felting & Wet Felting Workshops, Delights and Ideas. 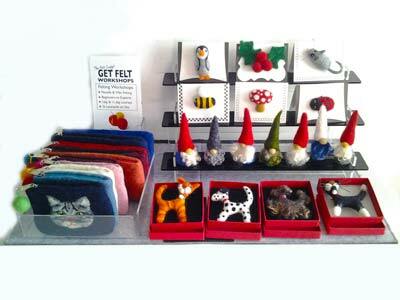 I teach needle felting and wet felting in small, popular workshops. What are Needle Felting and Wet Felting? They are ways of binding wool together to make decorative and useful things. They are traditional craftskills with no chemicals, no nasty bits …but wool is made from animals! There is more here on the About page. I always like to get people to start with the Essential Needle Felting workshop, as it really enables you to get felting, but in a way that works for you. See here for details, dates & available places. Moving on, we will have fun needle felting Scottie dogs brooches and Robins, embellishing Berets and more. Monthly up-dates, with new workshops added regularly. We will be experimenting with wet felting “Cracked Mud” and also wet felting Soap, Spring Flowers and Poppies for November. Starting off with Wet Felting Soap in February. For Christmas (yes, Christmas 2019) I am thinking about needle felting Mice on Skiis, a Robin Brooch and Elf/Santa Brooch and wet felted Christmas soaps. But this will not be until October time! Thank you so much for this morning’s workshop which I thoroughly enjoyed. I finished off my heart with a sprig of lavender which was very successful! My son, aged 12, was so impressed with the pack that together we have already made 2 more items, (round brooches, one with a Robin and one with a beach scene). The whole workshop was so interesting and has been so inspiring and I would absolutely love to come to you again to learn more! Oh and your coffee and cake was wonderful! It was a great day (again!) and I think we were all pleased with our creations. I have certainly got hooked and I intend to attempt more felted animals - It is a scary thought without your guidance but I think you have given us a good grounding so fingers crossed we don't get too daunted. Hope to see you at another course before too long. Held in my home in St Leonards on Sea (workshop details here), the workshops are all half day. But you never know a full day may creep in. They are limited in number (maximum of 5) as I’ve found it’s more fun and better learning that way, and come with most things supplied. Some of the special workshops need special tools. They aren’t expensive but I’ll advise you in advance and have them in stock. The half day workshop include home baked cake. Yippee! and you have the pleasure in meeting Megan, my ace number Bouvier des Flandres (posh way of saying – dog). Coffee, tea and biscuits are all included and you will definitely meet some lovely people too. There is a dog. Her name is Megan. I love her. She will almost certainly love you too. Now you know. If you have something you’d like made for you please give me a call and we can have a chat about it. (01424 421412). To get an idea of what I do and have done please see examples on the Commissions page and also The Gallery. I also exhibit and sell from Rye’s Handmade, a lovely shop in Rye. My stock there is ever changing as it gets bought up by avid felt lovers, but if you are in Rye please drop in as you won’t be disappointed. Sign up here for news and the inside info! Need to talk to me, Valerie?